Grazing of the Dubai inland desert has changed substantially over the last century, and particularly over the last three decades. Populations of oryx, ostriches and gazelles have been replaced by an increased camel herd, which are at least 2.5 times historical levels. Camel grazing patterns differ to smaller herbivores, affecting plant species composition. Camels are given supplementary feed, so their population is not limited by seasonal availability of vegetation. Desert plants face longer periods of heavy grazing from a larger camel population, and shorter periods for recovery. Plant chemical defenses may also be less effective from the different grazing regime. 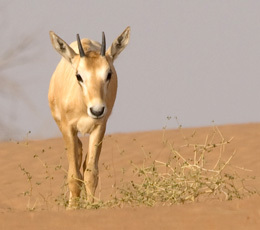 Although widely considered to be overgrazed, there is little information in the UAE on appropriate stocking levels for purposes of ecological sustainability or for maximizing pastoral production. The effect of grazing on vegetation was studied within the recently formed Dubai Desert Conservation Reserve (DDCR). Camel farms on the DDCR release camels during the day, allowing them to graze natural vegetation within the Reserve. It also contains an inner enclosure of five years in which camels were replaced by oryx and gazelles, separated by a 20 km fence. Fence line studies were made of (1) small (<1 m high) perennial plants, (2) seedling emergence during the winter of 2004/5, and (3) size and distribution of large shrubs (> 1 m high). In addition, telephone surveys were conducted on DDCR farmers, and spatial distribution of trees was recorded. Heavy grazing in the DDCR has reduced the cover of small perennial plant species, reducing their capacity for annual forage production. The extent of overgrazing on gravel substrata was severe, but it was also significant on sand substrata. There was some evidence of localized dune stabilization in the camel exclosure, due to increased vegetation. Germination density of perennial species was greater in the camel exclosure, probably caused by higher seed production of the larger plants. Germination density of annual plant species was not affected by grazing, but was much greater in closer proximity to established small shrubs. No germination was observed to be associated with feces of camels, oryx, gazelle or Dhub lizards (Uromastyx aegyptiaca). Plants reached reproductive maturity at a height of 10 cm or less. Large shrubs were differentially impacted by grazing systems. Calligonum comosum was devastated by camel grazing. Leptadenia pyrotechnica and Lycium schawii were substantially reduced in size, though their long term impact is not yet known. Two species benefited from heavy grazing; the large shrub Calotropis procera and the sedge Cyperus conglomeratus. Among trees, the regeneration of Prosopis cineraria appears to have been severely reduced by herbivory at the small shrub stage, but no evidence of effects on Acacia tortilis was recorded. Observed vegetation differences were primarily due to a greater level of grazing in the DDCR than the exclosure, but the ecological impact of camel grazing differs to that of oryx and gazelles. Rapid recovery within the camel exclosure indicates that plant species are well adapted to periods of heavy grazing, and ecological degradation in the DDCR is reversible. Nevertheless, complete recovery of plant species composition may take decades after a reduction of stocking rate. Recovery would benefit native wildlife, and also farmers by reducing their reliance of supplementary feed. Several options for reducing the impact of camel grazing are considered.